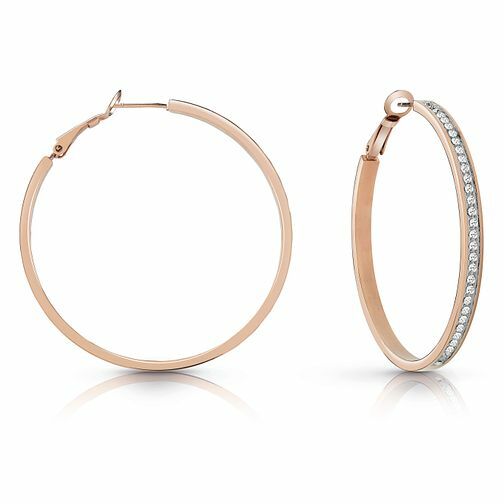 These Guess rose gold-plated hoops have a simple and elegant silhouette, with a refined white Swarovski® pavè setting on the front section, the perfect finishing touch to your outfit, day or night. Guess Rose Gold Plated 50mm Crystal Hoop Earrings is rated 5.0 out of 5 by 1. Rated 5 out of 5 by Anonymous from Daughter's 21st I bought these as a present for my daughter. She loves them. They are very pretty in the rose gold. She wore them recently on a night out and had a lot of lovely comments.